1. Helene Cooper, 'US Demands Return of Drone Seized by Chinese Warship', The New York Times, December 16, 2016 (accessed December 20, 2016). 2. Editorial, ‘China Tests US Resolve', Wall Street Journal, December 18, 2016 (accessed December 21, 2016). 3. People’s Republic of China, Ministry of Defence Press Statement, ‘China to Hand over Underwater Drone to US in Appropriate Manner', December 18, 2016 (accessed December 21, 2016). 4. People’s Republic of China, Ministry of Defence Press Statement, 'China Hands over Underwater Drone to US', December 21, 2016 (accessed December 28, 2016). 5. 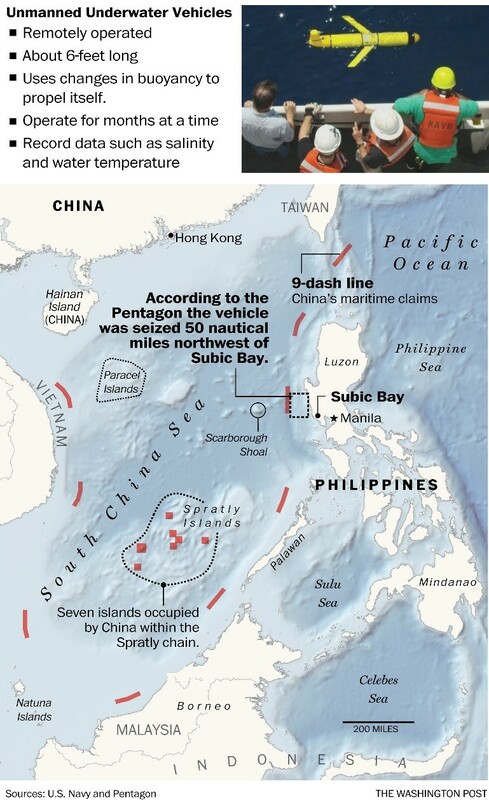 Missy Rayan and Dan Lamothe, 'Pentagon: Chinese Naval Ship Seized an Unmanned US Underwater Vehicle in South China Sea', The Washington Post, December 16, 2016. (accessed December 21, 2016). 7. Jeff M. Smith, 'China’s Drone Grab and the Dangers of "Strategic Ambiguity"', The Diplomat (accessed December 28, 2016). 8. Permanent Mission of the People’s Republic of China, Notes Verbales CML/17/2009 and CML/18/2009, May 7, 2009 (accessed December 21, 2016). 9. Permanent Mission of the People’s Republic of China, Note Verbale CML/8/2011, April 14, 2011 (accessed December 21, 2016). This Note did not contain a dashed-line map. 10. ‘China submission in compliance with the deposit obligations pursuant to the United Nations Convention on the Law of the Sea (UNCLOS)' (accessed December 26, 2016). 11. ‘Article 16:The provisions of this Act shall not affect the historical rights of the People's Republic of China', China Exclusive Economic Zone and Continental Shelf Act (accessed December 28, 2016). 12. United States Department of State Bureau of Oceans and International Environmental and Scientific Affairs, ‘China: Maritime Claims in the South China Sea, Limits in the Seas, No. 143', December 5, 2014 (accessed December 28, 2016). 13. Gregory B. Poling, 'Time to End Strategic Ambiguity in the South China Sea', Center for Strategic and International Studies (accessed December 23, 2016). 14. Zhiguo Gao and Bing Bing Jia, 'The Nine-Dash Line in the South China Sea: History, Status, and Implications', The American Journal of International Law 107 (1), 2013, pp. 98–124, doi:10.5305/amerjintelaw.107.1.0098 (accessed December 28, 2016). 15. People Republic of China, Ministry of Foreign Affairs, ‘Foreign Ministry Spokesperson Hong Lei’s Regular Press Conference', February 29, 2012 (accessed December 23, 2016). 16. Chun Han Wong, 'Nine-Dash Line’s Ambiguity a Good Thing, Argues Chinese Military Academic', WSJ, June 5, 2016 (accessed December 28, 2016). 17. ‘PCA Press Release: The South China Sea Arbitration (The Republic of the Philippines vs. The People’s Republic of China) PCA-CPA' (accessed December 28, 2016). 18. Alexis Romero and Edith Regalado, 'Rody Ready to Set aside Ruling on Sea Dispute', Philstar.com, December 18, 2016 (accessed December 28, 2016). 19. ‘Shifting Waters: China’s New Passive Assertiveness in Asian Maritime Security', Lowy Institute (accessed December 28, 2016). 20. Ronald O’Rourke, 'Maritime Territorial and Exclusive Economic Zone (EEZ) Disputes Involving China: Issues for Congress', (DTIC Document, 2015) (accessed December 27, 2016). 21. Peter Dutton, Military Activities in the EEZ: A US-China Dialogue on Security and International Law in the Maritime Commons (Newport, R.I.: China Maritime Studies Institute, US Naval War College, 2010), pp. 20-21. 22. ‘China to Hand over Underwater Drone to US in Appropriate Manner', n. 3. 23. People Republic of China, Ministry of Foreign Affairs, ‘Foreign Ministry Spokesperson Hua Chunying’s Regular Press Conference', December 19, 2016 (accessed December 28, 2016). 24. Hua Yiwen, 'Underwater Drone Just a Sample of US Military Action against China', People’s Daily Online, December 19, 2016 (accessed December 21, 2016). 25. 'China Hands over Underwater Drone to US', n. 4. 26. All incidents in the South China Sea have been charted in an excellent interactive map created by Maritime Awareness Project. ‘Interactive Map: Maritime Awareness Project' (accessed December 28, 2016). 27. Martin Pengelly, 'Donald Trump Accuses China of "Unpresidented" Act over US Navy Drone', The Guardian, December 18, 2016 (accessed December 28, 2016). 28. ‘The Implications of China’s Seizure of a US Navy Drone: Maritime Awareness Project', December 21, 2016 (accessed December 28, 2016). 29. ‘Salami Slicing in the South China Sea', Foreign Policy, August 3, 2012 (accessed December 28, 2016). 30. Brahma Chellaney, 'Creeping China', Project Syndicate, November 28, 2013 (accessed December 28, 2016).